It has been reported that JYJ’s Junsu ended up shedding a few tears during his first music show appearance on Korean television in six years. 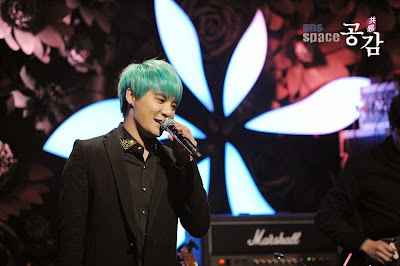 On April 13, Junsu took part in the recording for EBS’ music program “Space Sympathy.” During his final encore stage with the song “Uphill” (by Jung In and Yoon Jong Shin) filming was briefly paused because the singer was unable to hold back his tears. His fans, who looked on from the audience, also burst into tears upon seeing Junsu cry. After collecting himself, the singer carried on with the last song and successfully wrapped up the recording. EBS’ “Space Sympathy” featuring Junsu is scheduled to air on April 30 at 12:10 a.m. (KST).